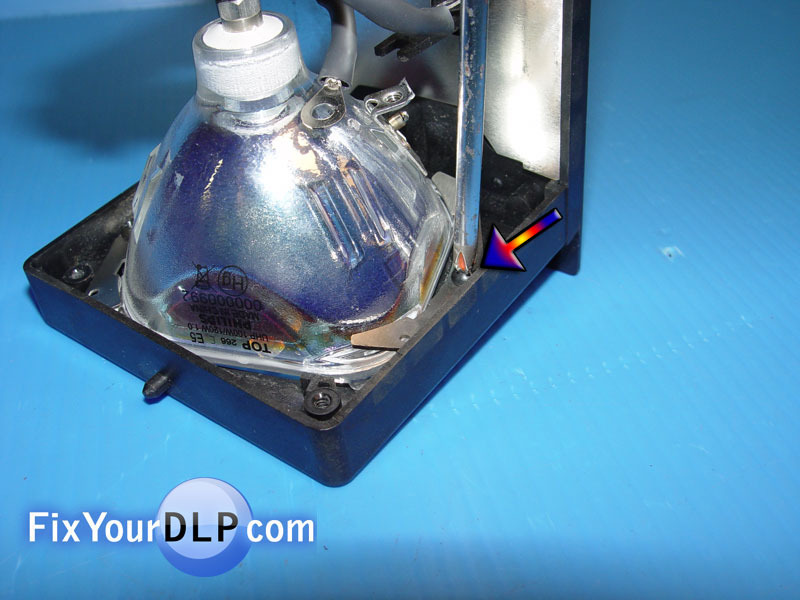 For Part Number: Panasonic DLP Lamp TY-LA1500 (Sealed replacement lamp for DLP televisions, small lamp with no vents). 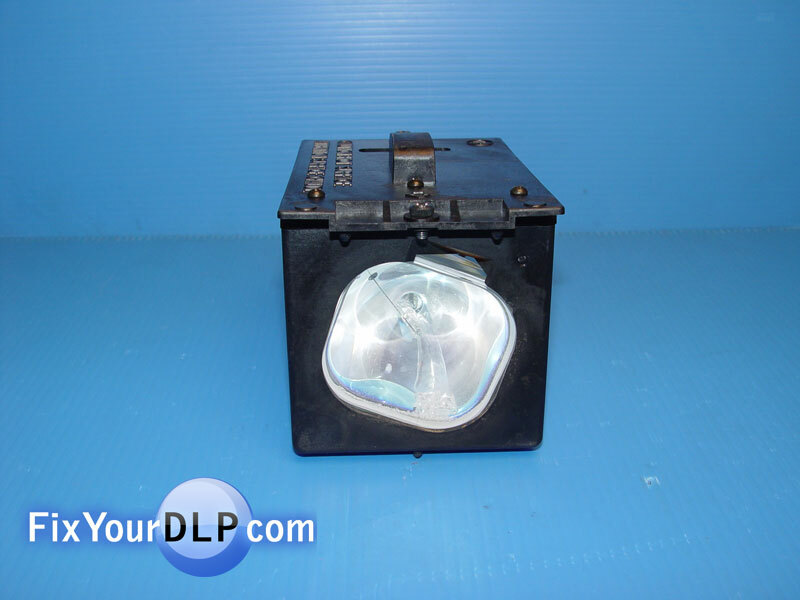 For Enclosure: Panasonic Lamp(enclosure TY-LA1500 / LSMP0378). 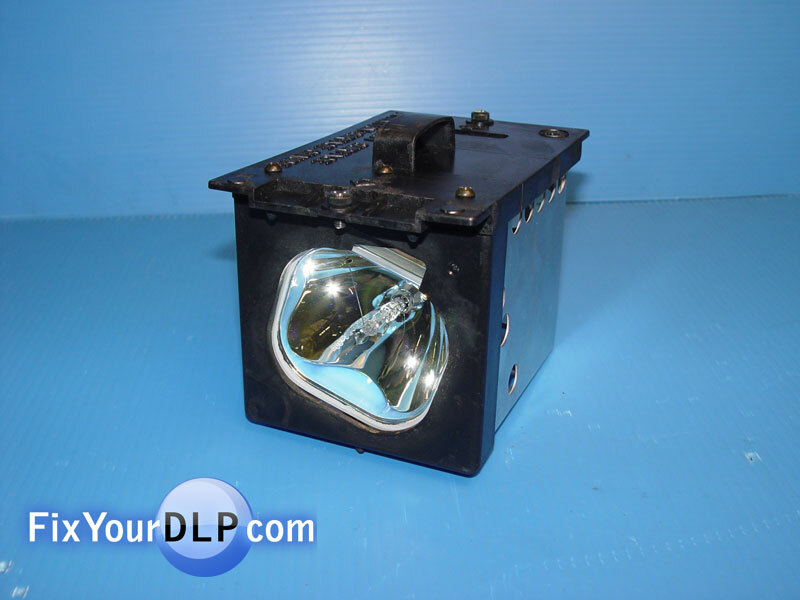 Compatible TV Models: PT40LC12, PT40LC13, PT45LC12. 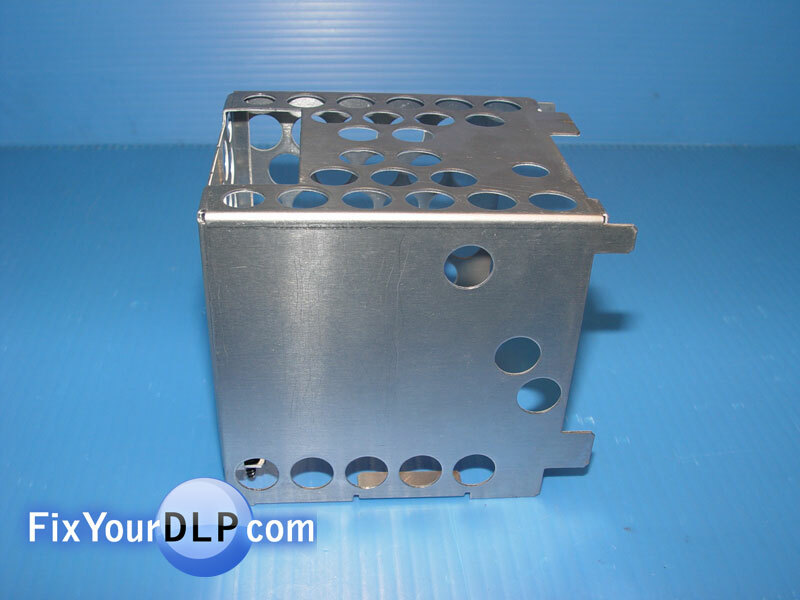 Assembly part numbers: LSMA0617, AM0000119. Tools Required: Long Standard Philips (magnetic tip), A new lamp. 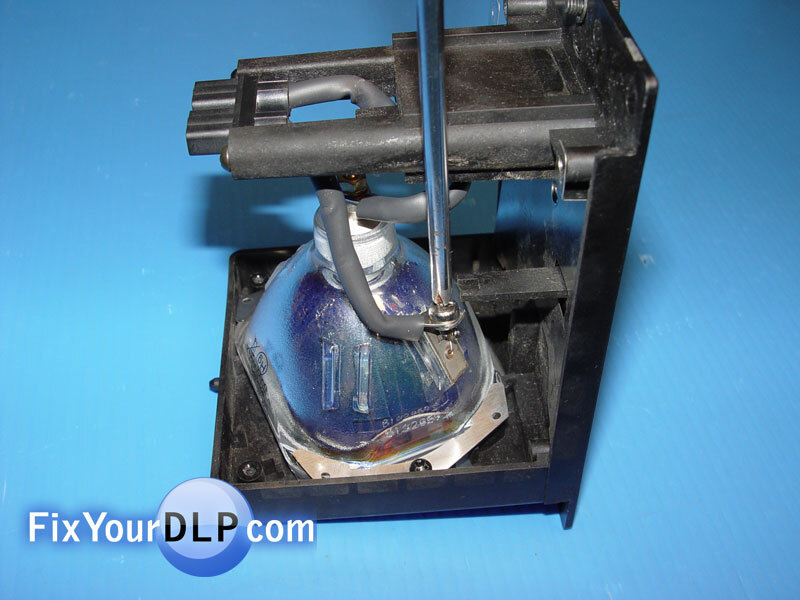 Abstract: This guide is being published to show how easy it is to replace your original Panasonic TY-LA1500 Lamp. 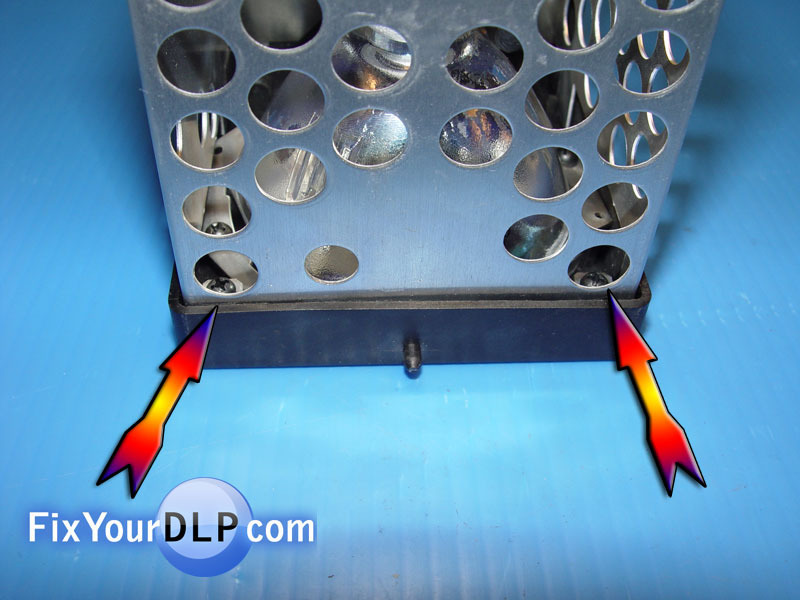 1.-Let’s start by turning up side down the lamp, you’ll notice that the metal cage is secured by four screwsfrom the inside. 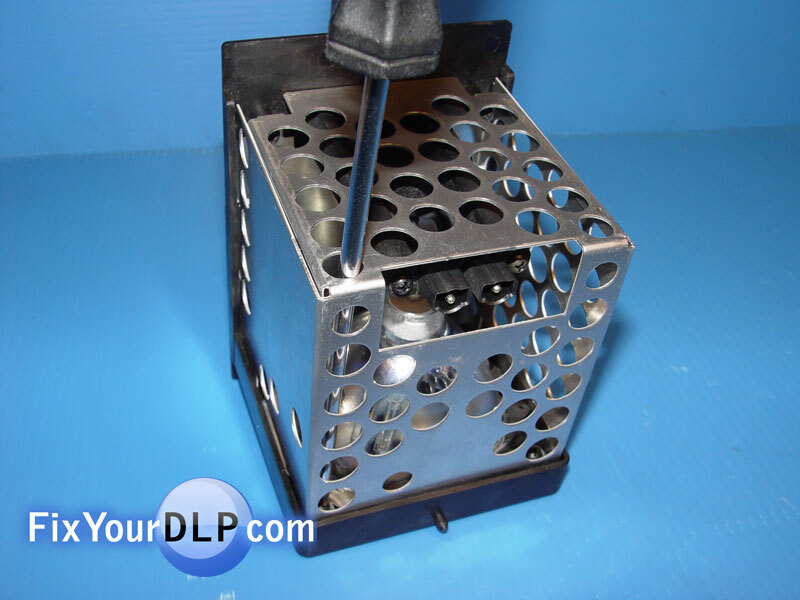 2.-To extract them you’ll need a long magnetized screwdriver introducing it through one of the holes in the metal cage. 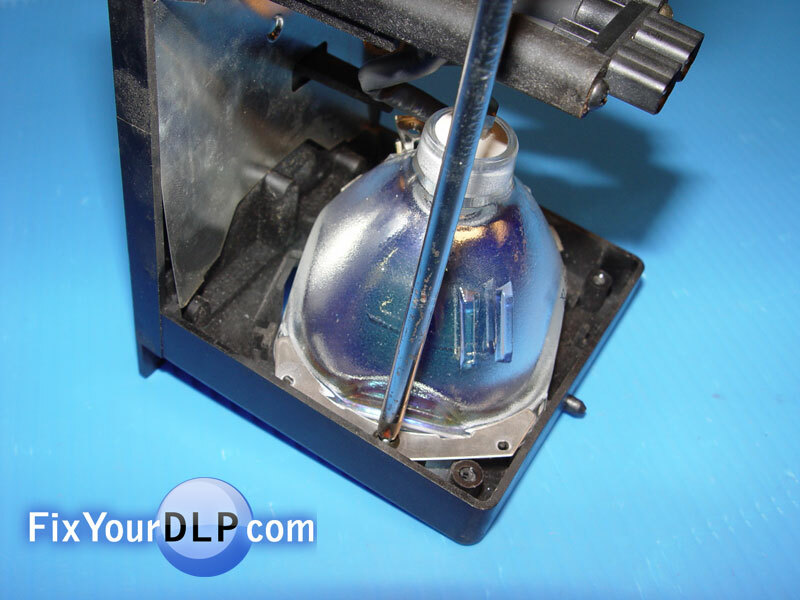 3.-After removing the first two screws, turn the enclosure on its side and remove the remaining ones. 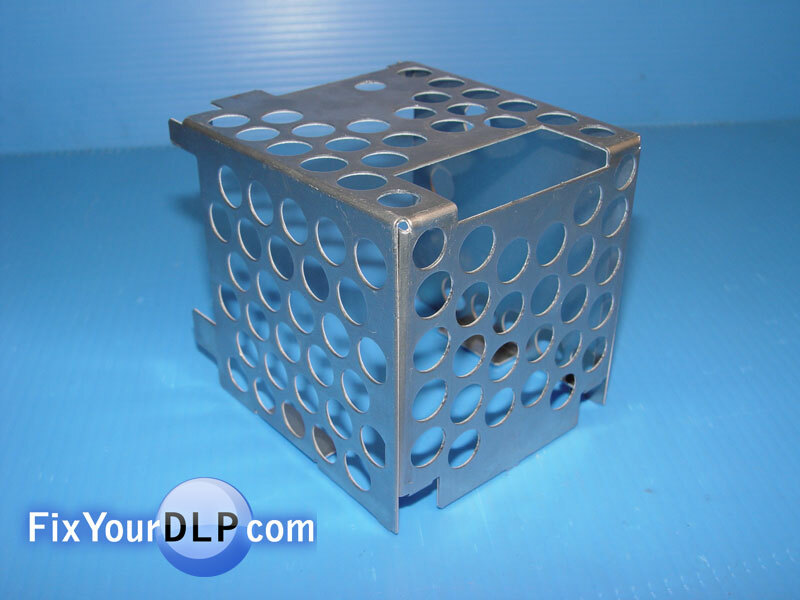 4.-After extracting the metal cage by lifting it up it will look something like this. 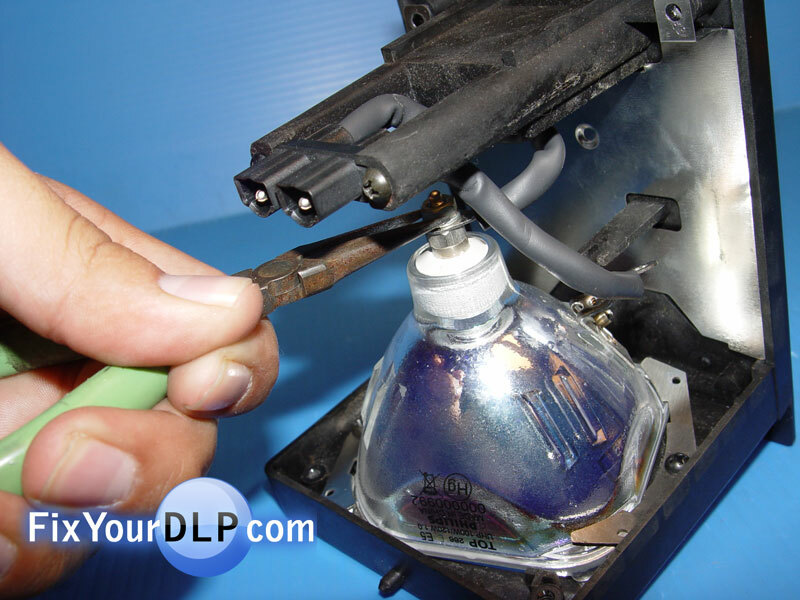 5.-Inside you’ll find the bulb, take out the screw that holds the lamp and a plastic cable on the side. 6.-And on the top terminal use your pair of pliers to loosen and separate the nut from the bulb. 7.-On the side of the lamp you’ll find two metal clips holding the lamp in place, unscrew and remove them to take out the old bulb. 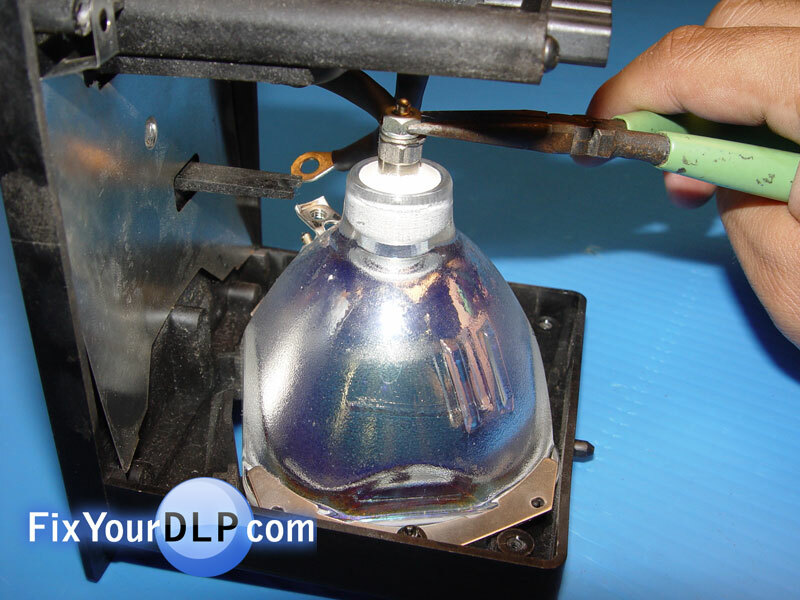 8.-After removing the old bulb take out your new one, which will look something like this. 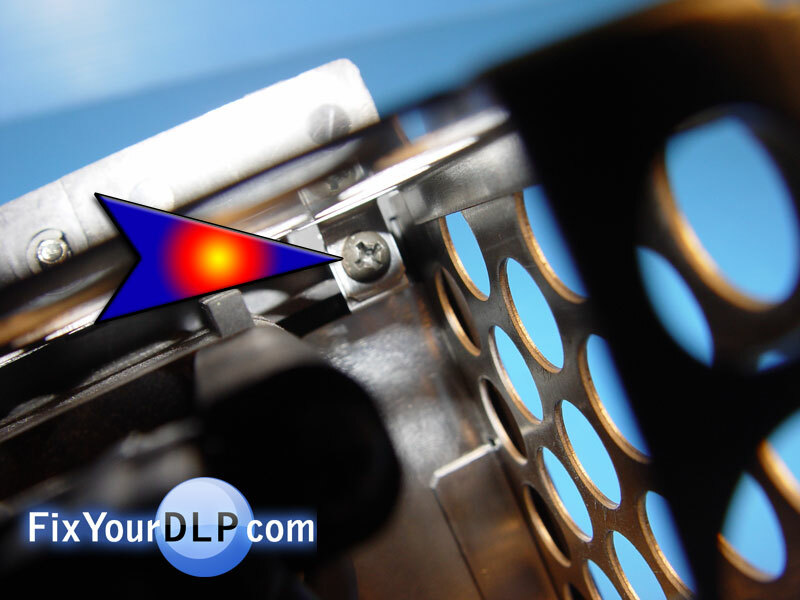 A.-Place the new lamp in its place and secure it buy tightening the two clips adjacent to it. 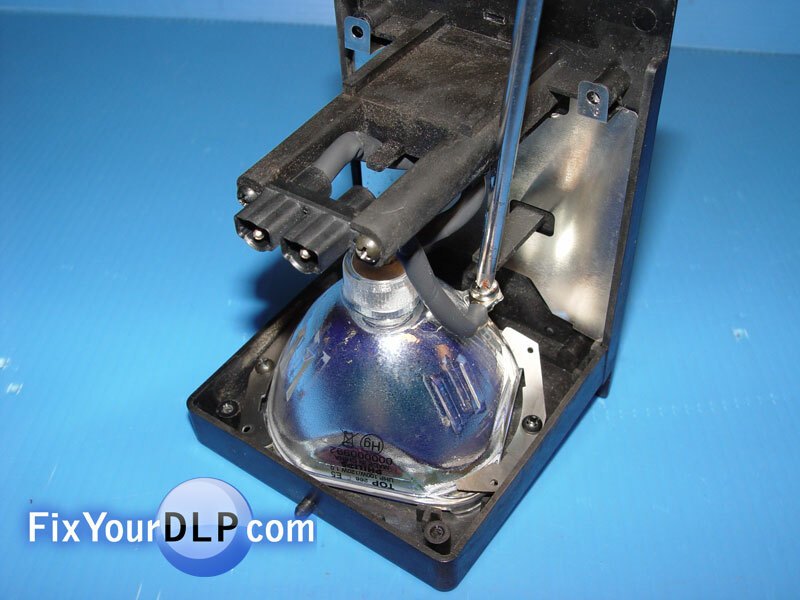 B.- Reinstall the nut on the top terminal of your new lamp to conjoin it with the plastic cable. 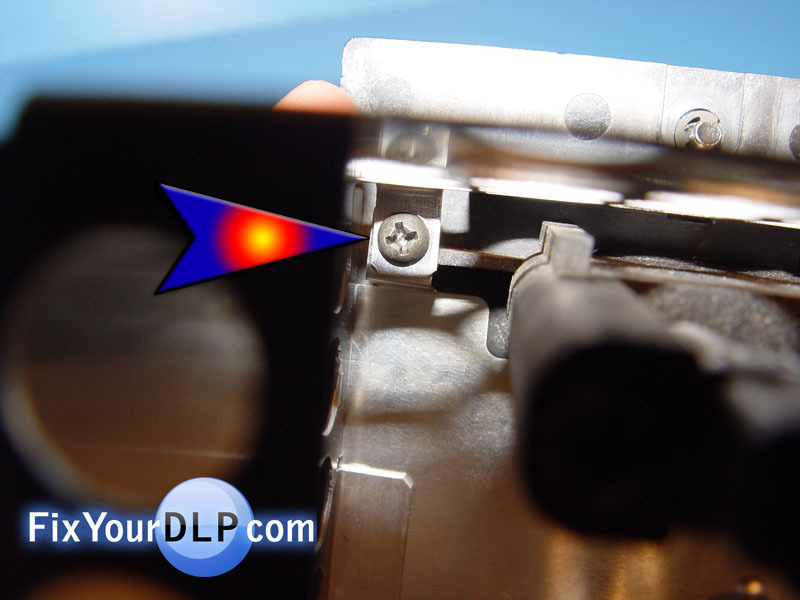 C.-Now place the small screw that connects the cable to the side of your new lamp. 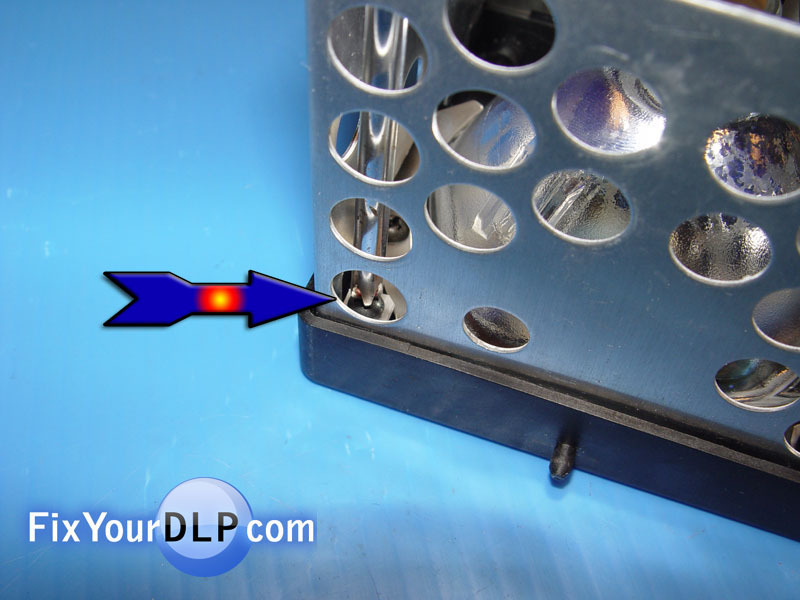 D.-Time to take and reinstall the metal cage, it was previously removed from the lamp enclosure. E.-Insert the four screws that hold the metal cage buy guiding them through the tip of your magnetized screwdriver. F.- Once secured all, they will look similar to this. G.-And you’re finished replacing your bulb.